Mark fulfilled in his life what every Christian is called to do: proclaim to all people the Good News that is the source of salvation. In particular, Mark's way was by writing. Others may proclaim the Good News by music, drama, poetry or by teaching children around a family table. Paul and Barnabas took him along on the first missionary journey, but for some reason Mark returned alone to Jerusalem. It is evident, from Paul's refusal to let Mark accompany him on the second journey despite Barnabas's insistence, that Mark had displeased Paul. Because Paul later asks Mark to visit him in prison, we may assume the trouble did not last long. The oldest and the shortest of the four Gospels, the Gospel of Mark emphasizes Jesus' rejection by humanity while being God's triumphant envoy. Probably written for Gentile converts in Rome—after the death of Peter and Paul sometime between A.D. 60 and 70—Mark's Gospel is the gradual manifestation of a "scandal": a crucified Messiah. Evidently a friend of Mark (Peter called him "my son"), Peter is only one of the Gospel sources, others being the Church in Jerusalem (Jewish roots) and the Church at Antioch (largely Gentile). Like one other Gospel writer, Luke, Mark was not one of the 12 apostles. We cannot be certain whether he knew Jesus personally. Some scholars feel that the evangelist is speaking of himself when describing the arrest of Jesus in Gethsemane: "Now a young man followed him wearing nothing but a linen cloth about his body. They seized him, but he left the cloth behind and ran off naked" (Mark 14:51-52). A winged lion is Mark's symbol. 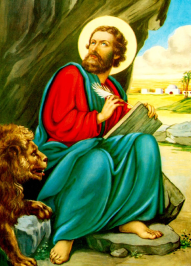 The lion derives from Mark's description of John the Baptist as a "voice of one crying out in the desert" (Mark 1:3), which artists compared to a roaring lion. The wings come from the application of Ezekiel's vision of four winged creatures (Ezekiel, chapter one) to the evangelists.